Open Water Source looks at the top male Olympic medal contenders and dark horses for the Olympic 10K Marathon Swim on August 10th in the Serpentine in Hyde Park. For complete and comprehensive coverage of the Olympic 10K Marathon Swim on August 9th and 10th, visit here. 1. Spyros Gianniotis (GRE with a 1:54:24.7 qualifying time) is the co-favorite for the Olympic gold medal with Thomas Lurz. The veterans have dominated the pro circuit and international competitions for the past year, constantly upping the ante as they have pushed the pace to a realm capable by only a handful of athletes. When the lead pack comes around the last turn buoy, expect Greece’s humble three-time Olympian to be shoulder-to-shoulder with Lurz for the lead. 2. Thomas Lurz (GER with a 1:54:27.2 qualifying time) is the co-favorite for the Olympic gold medal with rival Spyridon Gianniotis. Michael Phelps and Ryan Lochte’s rivalry is more celebrated, but Lurz and Gianniotis are similarly close…over a 10km course. A gentleman and sportsman extraordinaire, Lurz is the epitome of German efficiency – streamlined and balanced with incredible horsepower. When the lead pack comes around the last turn buoy, expect the 2008 bronze medalist to be shoulder-to-shoulder with Gianniotis in the lead. 3. Sergey Bolshakov (RUS with a 1:54:31.8 qualifying time) is a dark horse for an Olympic medal. Large and powerful, Bolshakov can hold his position – and move others out of theirs. Swimming quickly out of the shadow of his Russian teammate Vladimir Dyatchin, Bolshakov has the tools – speed, savvy and stamina – to make an Olympic statement on the largest stage in open water swimming history. 4. Alex Meyer (USA with a 1:54:33.1 qualifying time) is coached by a former boxer and is the son of a professor. Pugnacious and tenacious, intellectual and effectual, Meyer has the tools to overcome a collarbone injury that he sustained earlier this year. More importantly, Meyer is swimming for himself and on behalf his fallen friend and teammate, Fran Crippen. With a depth of motivation like no other, Meyer will dig deeper than anyone else in the field. The Olympic stage calls for dramatic heroic feats and Meyer is positioned with a more profound mission than anyone else in the Olympic Village. 5. Ky Hurst (AUS with a 1:54:33.9 qualifying time) is the most unorthodox finalist in the field. A true ocean waterman, he trained for a number of aquatic disciplines – all of which will benefit him in the compact course on the Serpentine. Turns, racing savvy and navigational IQ will be his calling cards, but his speed will be called into question on the last loop. 6. Francisco José “Kiko” Hervás (ESP with a 1:54:34.3 qualifying time) has the experience and the heart to hang with the lead pack throughout the race. Most definitely, a top 5 finish is within his potential, but everything would have to fall perfectly right for him to medal in the Serpentine against this loaded field. 7. Brian Ryckeman (BEL with a 1:54:36.1 qualifying time) has the length, racing experience and physical tools to medal. But like his long-time European rival Hervás, he will need to find the perfect mix of proper pacing, optimal positioning and an adrenalin-fueled finish to finish in the top 5. 8. Julien Sauvage (FRA with a 1:54:37.2 qualifying time) is ready to mix it up with his more celebrated marathoners, and he will slug it out with the best of them no matter what the pace. However, he will have a tough time keeping up with the top 5 men heading down the backstretch or finish. Yet his speed should help him lock down a top 10 finish. 9. Vladimir Dyatchin (RUS with a 1:54:38.7 qualifying time) was a gold medal favorite in 2008, but fell out of medal position on the last lap and was ultimately disqualified. Unsatisfied with his 2008 performance, Dyatchin knows this 2012 Olympic stage is his best chance for redemption. With the target off his back, Dyatchin still remains a mighty big gun in a loaded field. If any athlete knows what it takes to get on the podium, the two-time world champion is ready to pounce on the opportunity. 10. Andreas Waschburger (GER with a 1:54:39.8 qualifying time) is a daredevil and risk-taker. He is willing to push the pace and make a surge at an unexpected time to stay with his most experienced rivals. But as one of the youngest swimmers in the top echelon, his best Olympic performances are ahead of him. 11. Oussama Mellouli (TUN) is an intriguing game-changer in the marathon swim. The 2008 Olympic gold medalist in the 1500m freestyle in the pool, he is the fastest and most powerful swimmer in the field, whether it is a 200m sprint or a longer distance. But he is also the least experienced in the open water. He balances his inexperience with a straightforward strategy – start his kick with 2-3 km to go and challenge everyone to stay with him. He ups the ante and will challenge the other top swimmers – Lurz and Gianniotis – to stay with him. A chiseled athlete with a tenacious mindset, he would be the gold medal favorite were it not for his inexperience. But count on seeing the Tunisian flag being raised at the awards ceremony. 12. Richard Weinberger (CAN) is a young gun capable to swimming shoulder-to-shoulder with any athlete in the field. His down-to-earth casual demeanor will serve him well in the pressure-cooker in the Serpentine. He can turn on his speed as necessary and is ready to unleash his Canadian tenacity in the Serpentine from start to finish where he is expected to be in the top 5 if everything goes to plan. 13. Petar Stoychev (BUL) is at the tail end of his illustrious career, but he has been training with his German rival Lurz in the hopes of putting a finishing touch to a career of unprecedented records and victories over the past decade. 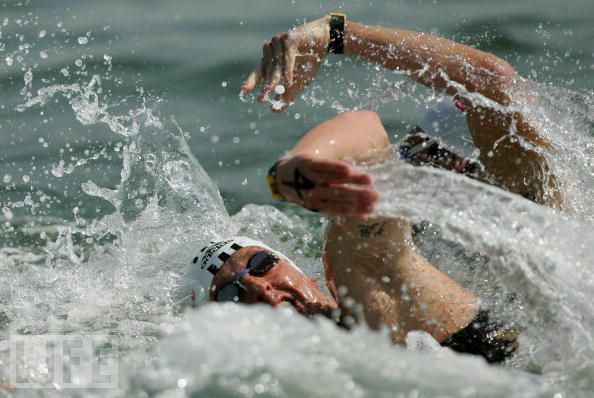 Unlike in 2008 when he swam the 1500m in the pool in addition to his 6th place finish in the 10km, the English Channel record holder will focus solely on the marathon swim. He is expected to stick with the leaders from start to finish, and may squeak in for a top 5 finish and, if fate treats him well, a medal finish. 14. Valerio Cleri (ITA) is poised to move up just one spot from his fourth-place finish at the 2008 Olympic marathon swim. A voracious workout swimmer, he is prepared to punish himself from the first stroke. Seriously intimidating, no one will move him out of position around a turn buoy. If he can benefit from a few tactical mistakes from the top swimmers and hits his taper just right, expect the Italian world champion to be smiling at the end with his Olympic dream realized. 15. Troyden Prinsloo (RSA) is big, fast and tough-minded. His pedigree as a world-class swimmer and hardened South Africa is more than enough to offset his relatively shallow open water swimming experience at this level. The two-time Olympian will be in the lead pack and can finish in the top 6 with a great finish and proper hydration throughout the race. 16. Yasunari Hirai (JPN) will hang with the leaders in the first half of the race and has the tools to finish in the front side of the secondary pack. He is moving up the ranks of the world-class swimmers, but his best performances are ahead of him. Look for the emerging Japanese star in a better position in 2016. 17. Igor Chervynskiy (UKR) is ready to rock and roll with the world’s best swimmers, but he will be hanging off the lead pack as the pace picks up between the 5-7 km mark. The 12th place finisher from the 2008 Beijing Olympic marathon swim, he may sneak into the top 10, but is more likely to finish in the top 15. 18. Ivan Enderica Ochoa (ECU) will be hanging with Hirai and challenging Chervynskiy, but he may take it out fast to try to get a jump on the second and third packs. He is rapidly improving, but this field may be too deep for him to finish in the top 15. Look for him to move up among the leading swimmers over the Rio Olympic quadrennial. 19. Arseniy Lavrentyev (POR) is an experienced savvy racer and understands all the tricks of the trade, but his speed is not enough for a top 10 finish. A powerful man, he finished 22nd in the 2008 Beijing Olympics and may crack the top 20 with an inspired effort. 20. Yuriy Kudinov (KAZ) is nearing the end of his illustrious career. A 5-time world champion from Kazakhstan and one of the fastest English Channel swimmers of all time, he is looking to put forth an Olympian effort and may finish in the top 15 with a fast second half and a few breaks in a tight second-tier pack. 21. Erwin Maldonado (VEN) will be solidly in the middle of the pack for 7-8 km. Similar to the 2008 Beijing Olympics, he is capable of a top 10 finish, but this London Olympics field is too deep and fast for Maldonado to repeat his 2008 performance. However, look for the Venezuelan ace to be leading the second-tier pack at the end. 22. Csaba Gercsak (HUN) could be prepared for a major breakout swim. He could finish anywhere from the top 10 to a finish in the trailing packs. If everything falls into place, look for him at the end of the lead pack at the end, but a top 20 finish is more likely for the long-time Hungarian mainstay on the professional circuit. 23. Mazen Aziz (EGY) is following in the wake of several decades of great Egyptian swimmers. Training in the United States, Aziz is prepared to swim fast enough for a top 15 finish if he can remain closely on the heels of the lead pack for the first 7 km. He needs to draft well and be willing to move at the 7km mark to finish solidly in the top 15. 24. Daniel Fogg (GBR) may have his best performance in the 1500m in the pool. But if his female teammate Keri-Anne Payne wins the women’s race on August 9th, there will be heaps of expectations placed on his shoulders. With a vast majority of the 30,000 spectators rooting for the British star, Fogg may fuel a top 10 finish with adrenalin, country pride and inspiration in front of a home crowd. 25. Benjamin Schulte (GUA) is a 16-year-old teenager who has the potential to compete well over the next 3-4 Olympics. He will swim as fast as he can, but he may finish well back of the main pack. Despite his inability to hang with all the world champions and Olympians for a full 10,000 meters, he may finish to some of the largest cheers heard in Hyde Park during the Olympics.